Metta World Peace was subdued and contrite in the Los Angeles Lakers' locker room, apologizing to Oklahoma City's James Harden for throwing the elbow that sent them both to the locker room in the second quarter. They both missed a beauty of a game that could echo into the postseason for two division leaders. Kobe Bryant scored six of his 26 points in the second overtime alongside an unorthodox Lakers lineup, and Los Angeles rallied from an 18-point deficit in the second half for a 114-106 victory over the Thunder on Sunday. Pau Gasol had 20 points, 14 rebounds and nine assists for the Lakers, who made an impressive comeback in their regular-season home finale against off-target Thunder stars Kevin Durant and Russell Westbrook, who combined to miss 42 of their 56 shots. Los Angeles' rally stunned the Thunder and set an early tone for their possible second-round playoff matchup. "It's not so much that we beat Oklahoma, but how we did it," said Bryant, who shook off his own woeful shooting game with two key 3-pointers late in regulation. "In the playoffs, particularly if you don't have home-court advantage, you're going to have games like this. We have to have the poise and the confidence to just keep chipping away." Yet everything after halftime was colored by the drama and violence that occurred 1:37 before the break. World Peace had just dunked over Durant and Serge Ibaka on a fast break and was headed back upcourt when he ran into Harden. While pounding his chest with his right arm, World Peace raised his left elbow over Harden's shoulder and cleanly hit Harden in the back of the skull. Harden dropped to the court and stayed down for about a minute before heading to the locker room. Ibaka and other Thunder players challenged World Peace, but were kept apart, and World Peace was ejected after officials reviewed the tape. "I got real emotional and excited, and it was unfortunate that James had to get hit with the unintentional elbow," said World Peace, who had scored 12 points and played solid defense on Durant. "I hope he's OK. Oklahoma, they're playing for a championship this year. I apologize to the Thunder and James Harden. It was just unfortunate." The Lakers rallied with seldom-used Devin Ebanks and Jordan Hill alongside Bryant, Gasol and backup point guard Steve Blake, who hit three key 3-pointers. Ebanks had eight points and two key defensive plays in the final minute, while Hill had 14 points and a career high-tying 15 rebounds. "Being down double digits against a very good team, we could have folded easily," Lakers coach Mike Brown said. "This might have been our best team win of the year." Bryant struggled through the first three quarters of his first home game since April 6 before coming alive down the stretch during Los Angeles' rally. Bryant then hit the tiebreaking fall-away jumper with 52 seconds left in the second overtime, followed by two free throws as the Lakers hung on. Even with Harden unavailable to provide his usual offensive boost, the Thunder could only blame themselves for a 4-for-19 fourth quarter with four turnovers, followed by a 5-for-17 effort in the two overtime periods. "I believe in Kevin, I believe in Russell, I believe in what our guys do," Thunder coach Scott Brooks said. "Some nights they're not going to fall for you, but if the execution is good and the shots are good, you have to live with the results." 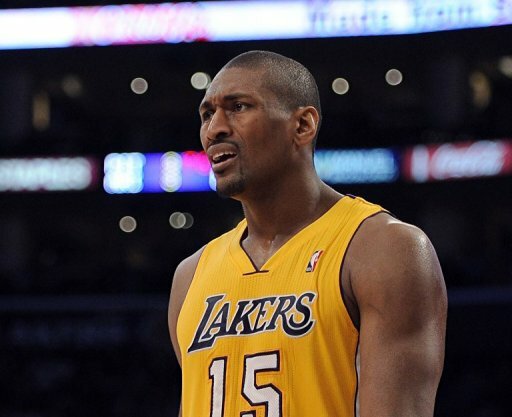 World Peace was making major contributions to the Lakers on both ends of the court before his ejection for yet another unpredictable outburst in the erstwhile Ron Artest's long history of misbehavior.